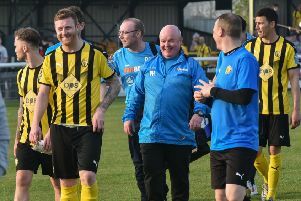 Leamington opened up a three-point gap at the summit of the Southern Premier League courtesy of an entertaining victory over full-time outfit Basingstoke Town, writes Paul Okey. The youthful visitors created several pretty passing moves as they looked to keep the ball on the floor but their tactic of repeatedly playing the ball out from the back allowed Brakes to seize possession in dangerous areas and play the majority of the game in the visitors’ half. Basingstoke were no fresh-faced lambs to the slaughter, though, as their recent thrashing of Slough attested, and they served notice of their threat inside the first minute when miscommunication at the back allowed Aaron Redford to nip in. However, he was unable to get enough elevation on his header to beat Tony Breeden. Ahmed Obeng dragged a shot past the post at the other end after neat build-up involving Darren Pond and Rob Thompson-Brown before Town enjoyed a good spell with Romone Rose prominent. A pull-back from the byeline presented Redford with a shooting chance that was blocked, while Rose was off-target with one effort and saw another comfortably pouched by Breeden. Courtney Baker-Richardson poked a shot wide before a pulsating opening 11 minutes was capped with an opening goal for the home side. Obeng laid the ball into the path of Baker-Richardson whose sidefoot shot was parried by Alex Tokarczyk and Obeng was following up to convert the loose ball. Brakes should have doubled their advantage two minutes later after Jack Edwards stole possession in midfield and the ball was worked to Ryan Rowe in space on the edge of the box. Despite having the whole goal to aim at, the striker tried to bend the ball into the top corner and got his connection all wrong, ballooning the ball harmlessly wide. Jack Edwards heads home Leamington's third goal after getting on the end of a Richard Taundry free-kick. A superbly worked overlap from the visitors set up a shooting chance for Richie Whittingham, but he could only shoot straight at Breeden. Obeng and Rowe both tried their luck for Brakes as the chances continued to come thick and fast for the season-high 526 who had braved a bitterly cold afternoon. Connor Gudger was unable to match an incisive build-up with a finish to match, with his shot under pressure skewed well wide, but just a minute later Brakes were two up. A miscued Tokarczyk clearance went straight to Thompson-Brown who, after being forced wide by the keeper, stood up a cross into the box which Baker-Richardson rose to acrobatically dispatch past the covering defenders on the line. Basingstoke were again culpable for Brakes’ next sight of goal with Charlie Kennedy’s misplaced pass in midfield putting Rowe on the attack. He in turn slipped in Obeng who cut inside and saw his shot blocked. Tokarczyk then went some way to atoning for his earlier error with a strong right-hand keeping out Thompson-Brown’s powerful strike. An innocuous challenge on Rose forced the frontman off, to be replaced by Aaron Jarvis and with it Basingstoke’s attacking threat was severely reduced. A second substitution immediately after the break saw Dan Collier introduced for Whittingham and Town boss Terry Brown was made his final change ten minutes into the second half when defender Matt Partridge pulled up after coming off second best to Obeng as he raced away down the left flank. The flying winger eventually reached the edge of the visitors’ box, laying the ball off for Edwards, who was unable to keep his shot down. He made no mistake in the 57th minute, however, stooping at the far post to guide his header from a Richard Taundry’s free-kick inside the far post and make it 3-0. A mistake from Jamie Hood presented Redford with possession in a dangerous position but his cross-shot flew across the face of the home goal unmolested. Edwards was inches away from converting a Gudger cross and Rowe was narrowly off target after combining well with Baker-Richardson as the hosts went in search of a fourth. Breeden picked up a booking after Nana Owusu beat him for pace out by the corner flag and a scrappy period of play was punctuated by a goal for Jarvis after Gudger had misjudged a bouncing through ball. It served to make the final 15 minutes less comfortable than they should have been for Brakes. However, it was they who came closest to adding to their tally, Obeng benefiting from a mistake by Marcus Johnston-Schuster to advance into the box and shoot straight at Tokarczyk. Brakes: Tony Breeden, Richard Taundry, Connor Gudger, Darren Pond, Jamie Hood (Callum Gittings, 76), James Mace, Courtney Baker-Richardson, Jack Edwards, Ryan Rowe, Rob Thompson-Brown, Ahmed Obeng (Tom James, 90). Subs not used: Joe Magunda, Ben George, Nathan Olukanmi. Basingstoke Town: Alex Tokarczyk, Marcus Johnson-Schuster, Robert Atkinson, Michael Atkinson, Matt Partridge (Joe Gater, 55), David Ray , Nana Owusu, Charlie Kennedy, Romone Rose (Aaron Jarvis, 34), Aaron Redford, Richie Whittingham (Dan Collier, 46).Subs not used: George Hallahan, Kieran Green.